If you have read my story you know that I used to be a processed food junkie. Rice-a-roni, Hamburger Helper, Kraft Mac & Cheese. My trash can overflowethed with boxes, and my blood pressure shot through the roof with all of that sodium! But I will admit, there were times when I secretly missed those wicked boxed meals. I think partially due to the ease but also, let's face it folks, our bodies get addicted to all of that crap! A funny story, Kevin had to do the cooking when I first came home from my surgery in 2010. He was working 9 hours a day as an auto mechanic, so he was physical all day long and totally drained by the time he got home. Plus he was spoiled because I had been cooking for him pretty much every day for the 2 years we had been together. He was not big on planning ahead, so most times he would stop at the store on the way home from work to grab something for dinner. Usually he would pick up some kind of meat to throw on the grill and a veggie, but a couple times he decided to go the easy way and picked up "quickie" meals. Once it was jarred spaghetti sauce, which I didn't think was all that awful but he refused to eat, and another time was Hamburger Helper......which, after one bite, went into the trash! Holy non edible food Batman!! It was horrid! So those days were gone without looking back. Until one day, for Lord only knows what reason, I found myself craving the old Cheeseburger Macaroni. 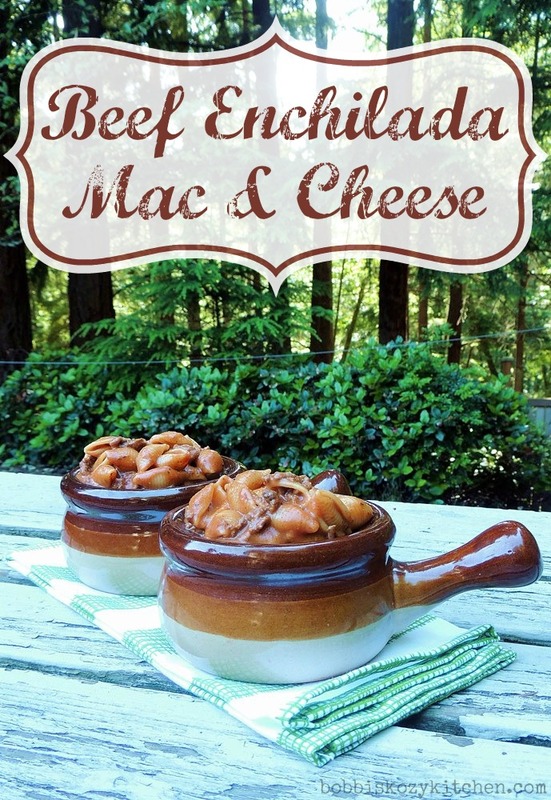 That was when I decided to work on my own version, and came up with my Mushroom Swiss Cheeseburger Macaroni. Kevin had a big bowl of it for dinner, and gorged himself on it the entire next day. I think I got one more small bowl out of a recipe that serves 6 to 8!! Ummm I think he liked it just a bit. Oh, and I ended up in the dog house with the kids because I didn't save any for them. I had to explain that I was afraid to get anywhere near the leftovers for fear of losing a finger. I told them I would make it for family dinner sometime and let them battle over who gets how much. I had wanted to work on more flavors, but that plan kind of went to the side for some reason. My close second favorite to the Cheeseburger Macaroni was the Cheesy Enchilada, oh myyyy how much I loved that one. So I was cruising the interwebs and found several links to blogs that had a recipe for Beef Enchilada Mac and Cheese, and my creative juices started flowing (which sounds a lot better than saying I started drooling right?). I eventually tracked most of them back to a post by Shugary Sweets. Her's is fabulous and, I have to admit, a bit easier than mine. But I wanted to push the flavor a bit more, and try to lower the fat a tad. So into my kitchen I went and this is the product that I came up with. Is it vain for me to tell you that, as I was tasting the different stages of the sauce, I was doing the happy dance around my kitchen? I hope not because I really couldn't help it!! This time I made sure to save some for the kiddos, and this recipe makes plenty enough to share. Everyone, and I mean evvvveryone that tried it ADORED it!! As a matter of fact the kids have already put in their order for another batch! Heat a large pot of salted water to boiling. Add the pasta and cook according to package directions. Drain cooked pasta and reserve. Meanwhile, in a small skillet, brown the ground beef using a wooden spoon to break it up. Drain any fat and set aside. In a medium pot, melt the butter over medium-high heat. Whisk in the flour, cooking for a minute or two. Add the chili powder, oregano, cumin, garlic powder, onion powder, and coriander, stir to combine. Add the warm stock and warm milk, whisk to combine. Add the tomato paste and lime juice and continue to whisk. Once the sauce begins to thicken, remove from the heat and stir in the cheese by handfuls making sure the previous handful has completely melted before adding another. Remove from the heat and combine with the cooked pasta and ground beef. Add salt and pepper to taste. Sounds soooo good! And don't worry, you're not alone, I loved those little boxes too. This is pure comfort food! I used to like a lot of prepackaged foods too, but I've definitely found they don't taste as good when I try them now. Yes, isn't it funny how our tastes change?